I am trying to interpret the variable weights given by fitting a linear SVM. I cannot find anything in the documentation that specifically states how these weights are calculated or interpreted. Does the sign of the weight have anything to do with class? 1) Recall that in linear SVM, the result is a hyperplane that separates the classes as best as possible. The weights represent this hyperplane, by giving you the coordinates of a vector which is orthogonal to the hyperplane - these are the coefficients given by svm.coef_. Let's call this vector w.
2) What can we do with this vector? It's direction gives us the predicted class, so if you take the dot product of any point with the vector, you can tell on which side it is: if the dot product is positive, it belongs to the positive class, if it is negative it belongs to the negative class. 3) Finally, you can even learn something about the importance of each feature. This is my own interpretation so convince yourself first. Let's say the svm would find only one feature useful for separating the data, then the hyperplane would be orthogonal to that axis. So, you could say that the absolute size of the coefficient relative to the other ones gives an indication of how important the feature was for the separation. For example if only the first coordinate is used for separation, w will be of the form (x,0) where x is some non zero number and then |x|>0. The documentation is pretty complete: for the multiclass case, SVC which is based on the libsvm library uses the one-vs-one setting. In the case of a linear kernel, n_classes * (n_classes - 1) / 2 individual linear binary models are fitted for each possible class pair. Hence the aggregate shape of all the primal parameters concatenated together is [n_classes * (n_classes - 1) / 2, n_features] (+ [n_classes * (n_classes - 1) / 2 intercepts in the intercept_ attribute). 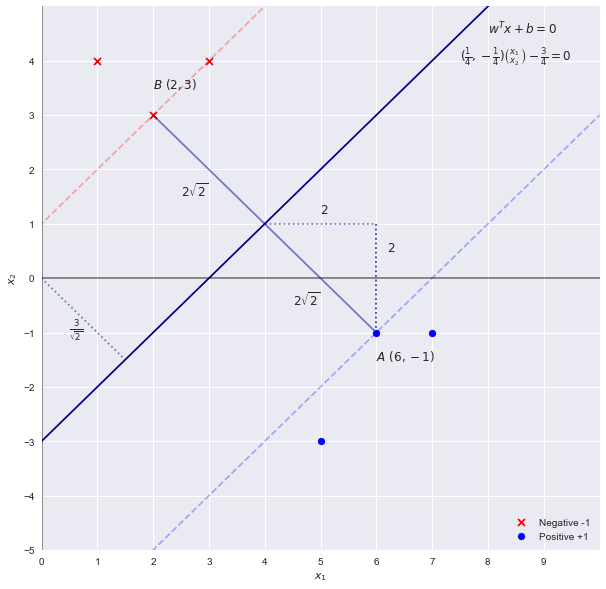 For the binary linear problem, plotting the separating hyperplane from the coef_ attribute is done in this example. If you want the details on the meaning of the fitted parameters, especially for the non linear kernel case have a look at the mathematical formulation and the references mentioned in the documentation. A good way to understand how the weights are calculated and how to interpret them in the case of linear SVM is to perform the calculations by hand on a very simple example. Not really, the sign of the weights has to do with the equation of the boundary plane. Check this paper on feature selection. The authors use square of weights (of attributes) as assigned by a linear kernel SVM as ranking metric for deciding the relevance of a particular attribute. This is one of the highly cited ways of selecting genes from microarray data. A great paper by Guyon and Elisseeff (2003). An introduction to variable and feature selection. Journal of machine learning research, 1157-1182 says: "Constructing and selecting subsets of features that are useful to build a good predictor contrasts with the problem of finding or ranking all potentially relevant variables. Selecting the most relevant variables is usually suboptimal for building a predictor, particularly if the variables are redundant. Conversely, a subset of useful variables may exclude many redundant, but relevant, variables." Therefore I recommend caution when interpreting weights of linear models in general (including logistic regression, linear regression and linear kernel SVM). The SVM weights might compensate if the input data was not normalized. The SVM weight for a specific feature depends also on the other features, especially if the features are correlated. To determine the importance of individual features, feature ranking methods are a better choice. Not the answer you're looking for? Browse other questions tagged svm feature-selection python scikit-learn or ask your own question. How does a Support Vector Machine (SVM) work? How to construct the feature weight vector (or decision boundary) from a linear SVM classifier with scikit? How to use Weight vector of SVM and logistic regression for feature importance? How do I use weight vector of SVM and logistic regression for feature importance? What does sample_weight mean in LinearSVC in scikit-learn? What type of SVM should I use for datasets of less and more than 10000 samples?